….Worried about hyperinflation, social unrest or even martial law, she and her Tea Party members joined a coalition, Friends for Liberty, that includes representatives from Glenn Beck’s 9/12 Project, the John Birch Society, and Oath Keepers, a new player in a resurgent militia movement. 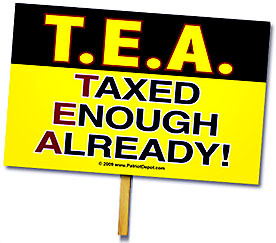 ….The ebbs and flows of the Tea Party ferment are hardly uniform. It is an amorphous, factionalized uprising with no clear leadership and no centralized structure…..They are frequently led by political neophytes who prize independence and tell strikingly similar stories of having been awakened by the recession. Their families upended by lost jobs, foreclosed homes and depleted retirement funds, they said they wanted to know why it happened and whom to blame. That is often the point when Tea Party supporters say they began listening to Glenn Beck. With his guidance, they explored the Federalist Papers, exposés on the Federal Reserve, the work of Ayn Rand and George Orwell. Some went to constitutional seminars. Online, they discovered radical critiques of Washington on Web sites like ResistNet.com (“Home of the Patriotic Resistance”) and Infowars.com (“Because there is a war on for your mind.”). If you think these folks have a serious chance at building a movement, this piece is pretty scary. But if you think they’re such obvious cranks that they’ll never be able to organize beyond the PTA level, it’s actually a bit of a relief. I’m mostly in the latter camp. What’s more, if writer David Barstow is right, their energy is largely driven by hard times. Once the recession starts to abate, they’re going to lose a lot of steam. But whether or not you agree, the whole piece is worth reading.